You can count on RenoSEO. We stand behind our work with a 100% Money Back Guarantee. Our search engine savvy team have pledged to deposit your funds in a secure account for 180 days, or until we deliver page one for you. 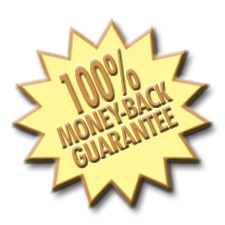 We know what we can do and we back it up with this unbeatable guarantee. Our actual fees may differ from client to client however to get our 100% money back guarantee you must sign up for RenoSEO's Daily Updates. Some clients opt for a smaller initial fee and pay offer a percentage of future of profits instead. Our methods are unique to our industry and will not be related online. All interested parties can schedule an appointment for more details on actual plan of action. Our flat rate for optimization covers all initial set up for your sites optimization. Other non-refundable fees for news submissions will apply. Our Search Engine Optimization Guarantee came to be after talking with other SEO companies from around the country. I put the question to them all, " Why don't you offer a guarantee?" The usual answer was, "You can guarantee something like that." Well let me assure you; you can guarantee something like Web Site Optimization; if you know what you are doing and you believe in yourself. I ignored the rest of the SEO industry and with wonderful results. We know we can deliver page one for you. You have nothing to lose by giving us the chance to prove it.